The goal is to ride in the best waves. Some of us live near bodysurfing protected spots like Point Panic or Wedge, but the rest of us are tasked with finding our own way through the surf crowd. This doesn’t have to take the jam out your donut, navigating surf crowds is a practiced skill and here are a few things to keep in mind when navigating the lineup. Don’t be too proud to take scraps. You’re not going to tread out to 8-10ft Pipeline and find yourself dropping in on the peak in the middle of 60 surfers. Quit daydreaming. You can however sit on the shoulder of great waves and score head-high perfection. Some of my favorite bodysurfing sessions have been on maxed out beach break days when all the surfers are scrambling way outside because they don’t want to get caught inside by a set. We bodysurfers had slightly smaller, but far better shaped 5-6ft waves all to ourselves. I love a big wave as much as the next guy, but there are days when the scraps are really the main course so don’t let your ego ruin the chance for an amazing session. Keep your head on a swivel and be in position. Know your positioning at all times. We’ve all swam with guys who are “swell magnets.” They seem to always be in perfect position. These are the bodysurfers who are listening to what the waves are saying. They started watching as soon as they pulled up to the break, taking mental notes of where the waves are breaking best. These cerebral wompers are also watching which surfers are making the drop and which are not. All this information is vital to success because what you can see from the water is just a snapshot of what the entire break looks like. Getting yourself to that sweet spot is a combination of understanding the wave and being aware of the surfers around you. If you can find the area where you can remain while still monitoring the surfer dropping in at the peak, then you have the potential to score amazing waves when he chunks the takeoff. This strategy does retain a certain level of risk and to be safe you have be certain that the surfer will not make the wave, but if you can juggle those factors you’ll find yourself on some of the best waves of the day. Be loud to be safe. 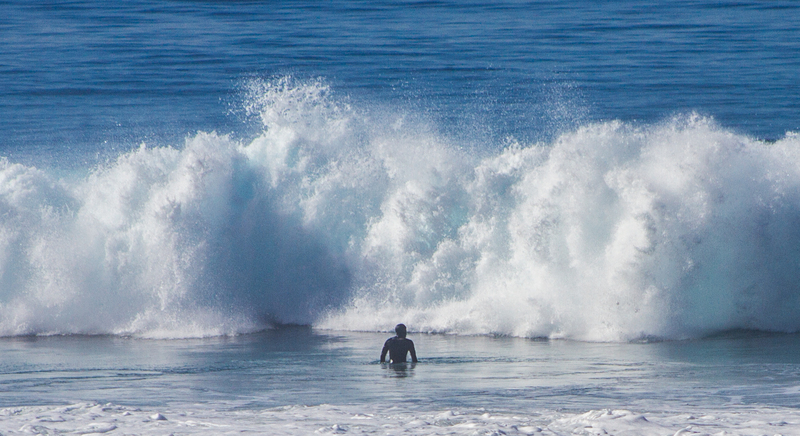 When a bodysurfer is propelling into a wave most of their body is submerged. This presents an obvious difficulty for surfers to identify a rider coming down the line. Some surfers simply don’t respect a bodysurfer’s right of way, but I would argue that most drop-ins happen as a result of ignorance. Since our presence is often masked visually, you may have to resort to being heard rather than seen. 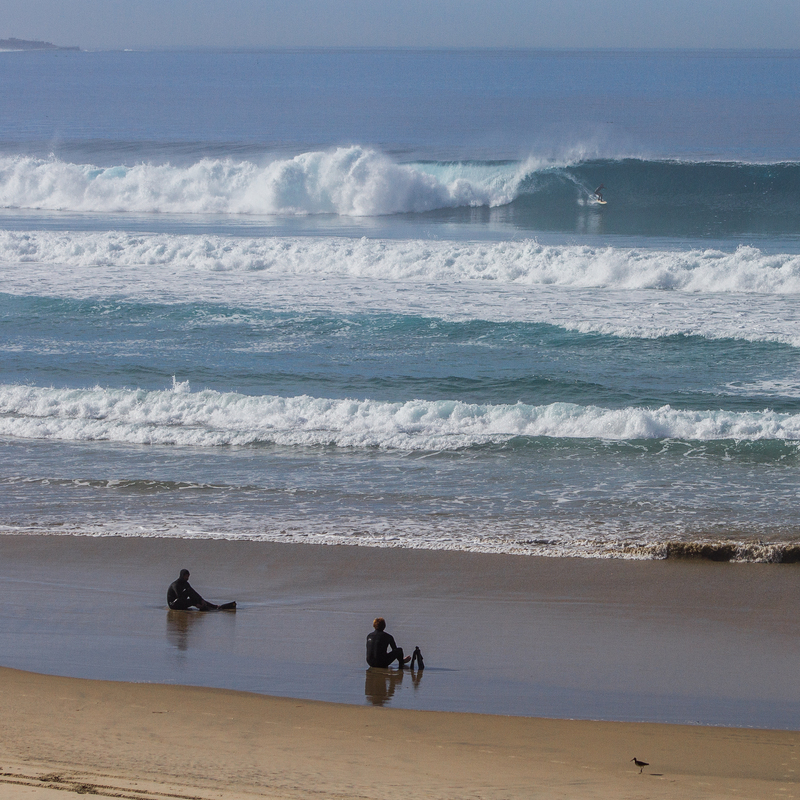 A quick hoot down the line will make any surfer down the line aware of your intention. It is an unfortunate, but often times necessary safeguard since bodysurfers are keenly exposed to the trauma of a dropping in surfer. If you intend on using this technique at a premiere wave you should also intend on following tip 4. If you are hooting and hollering when you make your drop, you can be sure there will be some eyes on you in a crowded line-up and just like any surfer if you can’t make the wave you’ll lose respect instantaneously. So, make the wave. There’s no better way to lose access in a crowded spot than to call guys off and then pop up 15 feet down the line. Like it or not, surfers are always sizing up the other guys in the water, so commit to your waves with vigor and you’ll find yourself with a fair size of the pie. There are waves that are great for bodysurfing and there are waves that are not. Any wave that can be fun for you is worth a look, but if you are looking to get great waves then your ability to perform on the wave should be part of your decision making process. I would argue that to maximize a session the bodysurfer should choose waves in their goldilocks zone. If I stood on the beach and looked out at 10 waves in succeeding heights and difficulty I would choose the wave at the top end of my comfort zone. Knowing this would push my ability to ride the waves and at the same time provide maximum enjoyment. In the end, you’re the only one who can make this call and respectively the only one who is affected by your call. Good luck out there.